NGA moved from a productcentric to a datacentric organization. GIS changed the way flight information publications are produced and distributed. Geospatially enabled data enables fusion with other data for additional analysis. Transformation involves "a major change in form, nature, or function," as defined by Merriam-Webster's Collegiate Dictionary, Tenth Edition. Starting in early 2002, the National Geospatial-Intelligence Agency (NGA) undertook a transformation in the way the agency does business and supports customers by moving from a productcentric to a datacentric organization. The goal, in the words of former NGA director and retired Air Force Lt. Gen. James R. Clapper, Jr., was to provide customers "instant access to specific geospatial intelligence." 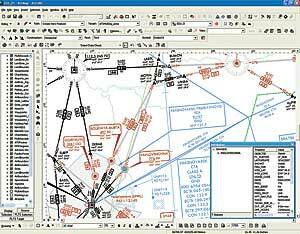 NGA has replaced its manual process for creating aeronautical charting products with a completely GIS-based process. Shown is an Enroute Chart being created using GIS. Headquartered in Bethesda, Maryland, NGA is a U.S. Department of Defense combat support agency and a member of the national intelligence community. The agency's mission is to provide timely, relevant, and accurate geospatial intelligence in support of U.S. national security. The agency's mission includes providing accurate aeronautical charts that are updated on a nationally and internationally mandated schedule. The transformation began with the implementation of GIS to change the way NGA Flight Information Publications (FLIPs) are produced and disseminated to customers. Until 2002, the process of producing NGA FLIP global charts required a large staff of aeronautical analysts, quality assurance specialists, and contractor personnel. Significant effort and expertise were required for chart maintenance. Geographic area analysts used drafting tools to create chart overlay lithographs to meet precise standards. For less complex chart changes, the analyst crafted textually descriptive directions called data abstracts using detailed format standards. Due to the complexity of the work and technical writing involved, all information received a second level of review by quality assurance specialists to ensure that it met NGA standards and was similar across all overlapping charts. The contractor used the data abstracts and/or the hand-drawn lithographs to create sticky-backed strip waxing ("stick-up") film overlays for text and/or graphic symbols. Each change was applied manually by scraping off old annotations and graphics and replacing them with the modification for the master versions of each chart. With more than 1,000 changes per month, this tedious process required great skill. Each of the four colors used on charts required a separate master layer, and screened colors required additional layers. The stick-up overlays were then used as the positive in a photo process to create negatives for each layer for every chart. In the busiest cycle, contractors produced more than 145 charts with an average of six layers each. Accuracy was imperative to ensure the layers merged to form the completed Enroute Chart when printed. With so many changes and the possibility of human error at many stages of production, consistent quality required great effort. Review and rework prior to publication expended many work hours and required substantial lead time to ensure the charts were finished before the next cycle began. While the GIS and mapping community might have been ready to support digital aeronautical charting long before, it took a stick-up crisis to force a change. The world's only manufacturer of stick-up stopped producing the material in 2001, and a new supplier could not be found. All remaining stock was purchased, but the clock started ticking. There were no suitable substitutes for the strip waxing film. A new method for correcting the charts had to be found before all the stick-up was gone. A GIS solution was an obvious choice, but there were many obstacles, most notably the lack of data. An aeronautical database did exist, it was kept current, and the attribution was robust. The data quality was exceptional, but it was not geospatial. NGA's Aeronautical Division turned to Esri for help in solving this critical problem. Together they worked on an ambitious program to create a completely GIS-based process to produce NGA aeronautical charting products. 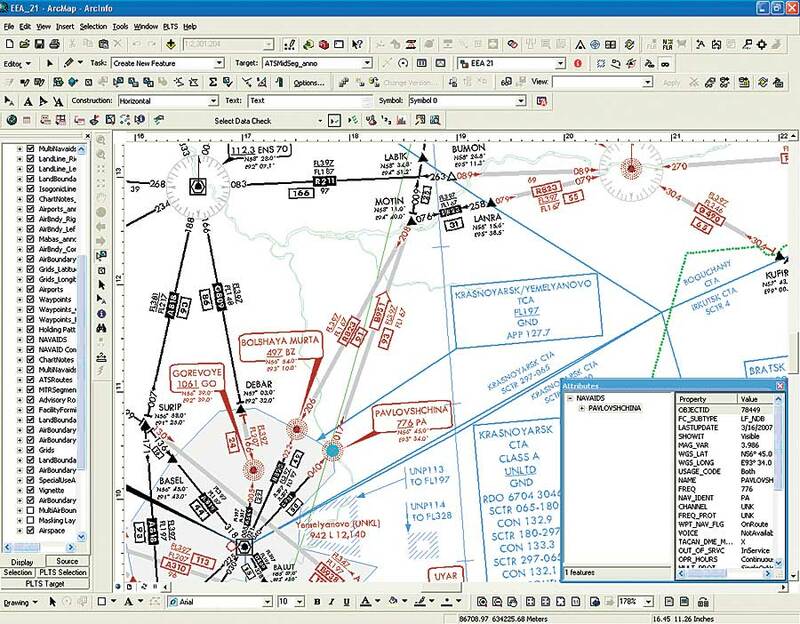 The foundation of the approach was Production Line Tool Set (PLTS) for ArcGISAeronautical Solution, which allowed NGA to develop a database-driven system to support digital aeronautical chart production. The NGA aeronautical database is imported into a geodatabase, and data is preformatted for charts during the data ingest. On a weekly basis, NGA provides database updates, and these transactions are loaded into the geodatabase, which has been optimized for cartographic output. Quality is ensured through several steps, and a Web-based scheduling tool monitors job progress, tracking every chart in every phase of production. Using this foundation, NGA is able to produce charts of any scale, orientation, and projection, in addition to the standard NGA series of aeronautical charts. PLTS for ArcGISAeronautical Solution manages the chart series design and incorporates intelligent elements that are automatically updated based on the content in the geodatabase. The database-driven system makes update management many times more efficient than in traditional manual chart production. One-time data entry allows greater accuracy by eliminating the possibility of errors in the production chain. When a feature update is transferred from the NGA database to the geodatabase, the change is automatically and immediately reflected on all associated charts. Text associated with modified features is automatically updated as well, using feature-linked annotation capability. As a direct result of the automation, digital data is synchronized with the paper product, and product quality has dramatically improved. NGA continues to deliver hundreds of thousands of Enroute Charts to aviators every 28 days without delay, and the output product is so similar to the manually prepared charts that customers never noticed. The digital Enroute Chart process supports direct-to-plate printing, completely eliminating the need for film overlays and stick-up. With NGA's traditional methods, a large percentage of energy was focused on the format and appearance of products, rather than on the depth of knowledge behind the data. Through this effort, its processes were transformed. Today, analysts devote their energy to creating and maintaining quality aeronautical information. Technology then transforms that quality data into a representation that the customer can utilize. The database-driven system also enables NGA to give customers a variety of new product options, from various digital formats to various printing options. And now that the data has been transformed into geospatially referenced digits, the data can be fused with other information for additional analysis, portrayals, and applications that have yet to be conceived. Using the geospatial knowledge of NGA's contracted experts, the aeronautical expertise of NGA analysts, and the power of GIS, even the sky is no longer the limit. Excerpted from "Aeronautical Transformation: Paper to DigitsChanging the Way the National Geospatial-Intelligence Agency Creates Aeronautical Products," presented by Charles L. (Chuck) McGaugh, Jr., at the 2004 Esri International User Conference. For more information, contact the NGA Office of Corporate Affairs, Public Affairs Office (Web: www.nga.mil), or Brian Cross, Esri (e-mail: bcross@esri.com; tel. : 909-793-2853, ext. 1-1158). See also "A Brief History of Aeronautical Charting."